So it’s difficult, complex, confusing and there is no correct answer. You are overwhelmed? Yep. You are disillusioned? Sometimes. You want to chuck it all in? NOPE. Not an option. When I get like this I consider NOT how to find the “right answer”. Basically cos’ there isn’t one (that alone takes some getting used to as a concept in our rationally-minded modern world). So instead I choose aspects of a product/criteria I am NOT willing to accept. Holding goods and services up to MY standards, rather than wading through thinking “oh, I don’t know, what is the right choice”? Here’s an example from my bathroom. See Amarjit Sahota’s book about how the cosmetics industry is greening up and improving their product integrity. I haven’t the sweet foggiest what a sustainable shampoo really is. 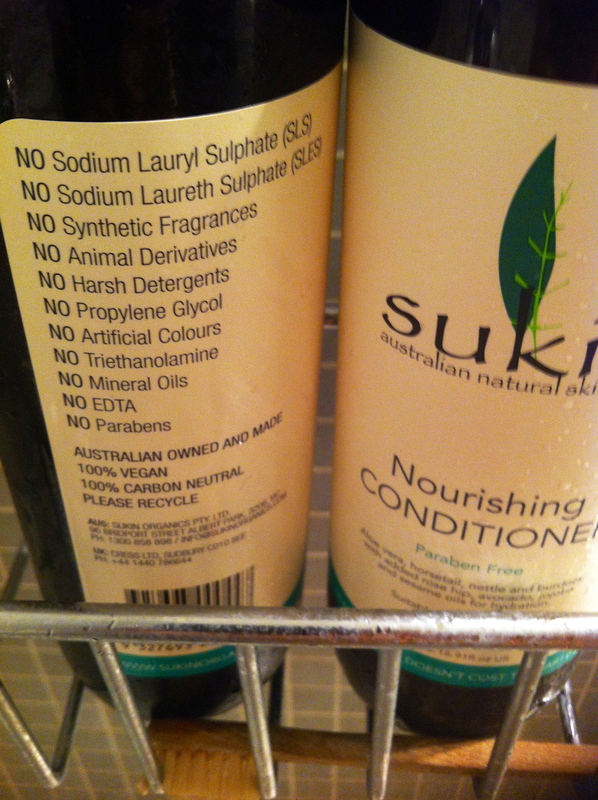 And I’m not really ready for egg-only shampoo – despite Deb Stewarts valiant efforts (on her “Sustainable Living Wise” blog). But am thrilled not to have unnecessary synthetic fragrances & as yet-to-be-proven-safe paraben preservatives running down my torso a few times a week for the next few decades. (Btw parabens may be associated with breast cancer). 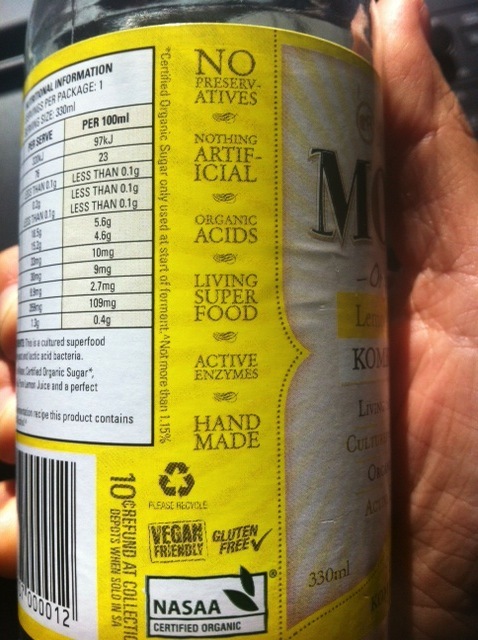 And am pretty happy to use products with less foam, less water, recycled plastic bottles, etc too. And the same goes for food. 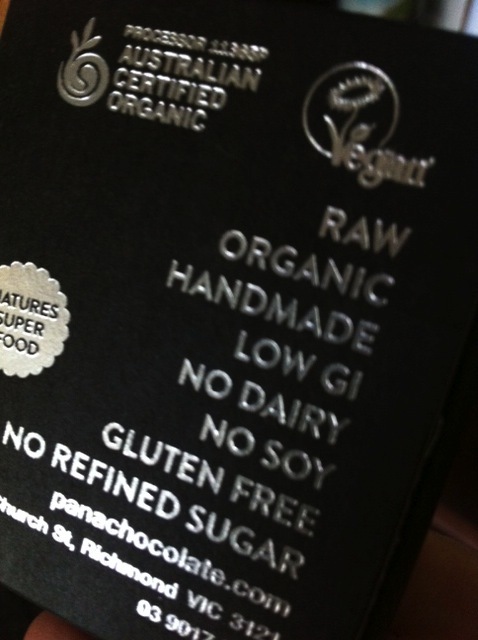 When I see a reverse-products list, that is, what’s NOT included, that’s 99% likely to be a more sustainable choice. Look at this lovely chocolate. They are called treats after all – so don’t treat yourself with fillers, palm oil, and conventionally grown cocoa which is one of the highest pesticide-using crops out there. Look for what is left out. Consider the “what is left out” approach as a criteria for things that are special, your best treats ! Or the things you routinely consume or live with. Same for your rare shop-bought drink, a big green no-no typically (in our house water in a carry bottle is the norm) but this is a-just-this-once and there was not a public tap to drink water from in sight……. It’s produced locally – in over 30 small-scale Australian locations – so fewer greenhouse gases used for transportation. I won’t do glass shipped miles and miles over the oceans & trundled over our roads in B-doubles. So the 10c refund logo always is a little extra benefit – kudos to South Australia for its healthy container return scheme that has operated continually since 1977. So, apply these rules to everything – to your food, your clothes, your furniture. What don’t you want? It’s pretty simple really. Just Don’t Do it. That’s sustainability. No destination, just a journey……..
Oh, dear, no idea how long ago you posted this comment. Sorry, still finding my way. Exactly. “Buycotting” is the phrase…..love word play. Btw I picked some of those weirdo eucalyptus flower caps just last week in McLaren Vale. And some massive gum seed heads, not sure of the latin name. Lovely.